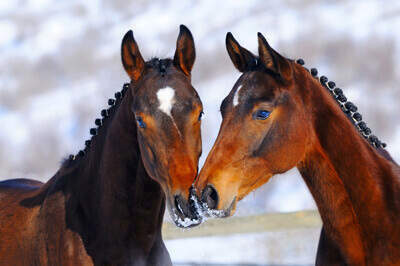 January 1st is considered the universal birth date for many horse breeds (i.e., Thoroughbreds, Quarter Horses), and breeders strive to have foals as close to that date as possible. In order to have mares foal close to that universal date, they must be bred in February or early March. Since mares are considered “long day breeders,” meaning the estrous cycle is controlled by the length of day, getting them to cycle when days are short can be a challenge. A mare’s estrous cycle is normally 21-22 days and is comprised of a period of diestrus (14-15 days) and estrus (7 days). The period of time when the mare does not come into estrous is referred to as seasonal anestrus and varies in length depending on the individual mare and geographic location. To encourage early breeding, mares should be put under lights that are bright enough to read a newspaper in the corner of the stall beginning in November to make the days appear longer. The natural daylight plus artificial lighting should total about 14-16 hours per day. Nutrition and body condition score (BCS) play important roles in the reproductive cycle and in ensuring a healthy pregnancy. Mares with a BCS of less than 5 can be more difficult to get in foal and maintain a pregnancy because they do not possess the energy needed to maintain their body weight and that of an embryo, as compared to a mare with a BCS of greater than 5. To increase the mare’s BCS (gain weight), she should be placed on an improved plane of nutrition to increase energy, along with other nutrients for 8 to 10 weeks, before going to the breeding shed. The gestational period for mares is, on average, about 340 days. During the first trimester, a mare’s nutritional requirements do not change from those needed for maintenance, so beware of overfeeding. During the last trimester when the majority of fetal development (approximately 80%) occurs, nutrient intake will need to increase to prevent depletion of body stores and a negative nutrient balance for the mare. Feeding a mixed feed designed specifically for broodmares may be beneficial to the mare during the 10th and 11th months; as the fetus increases in size, it takes up more room in the abdominal cavity and decreases the amount of forage that the mare can consume. Providing a balanced ration will also benefit the mare as she transitions from gestation to lactation. Be advised that the ration should also benefit the foal, as foals will begin nibbling at the grain at about 2 weeks of age. Mares that are nursing foals have an energy requirement similar to that of a race horse in training. Mares in early lactation (parturition through the 3rd month) require about 1.8-2.0 times more energy compared to her maintenance requirement, assuming she was an acceptable BCS before foaling. During this time, the mare will produce about 3% of their body weight per day in milk, which equates to about 33 lbs or about 4 gallons of milk per day for an 1100 lb mare. Her milk production will decrease to around 2% of body weight after about 3 months, which will drop her energy requirement to about 1.5 times her maintenance requirement. Remember, mares with an acceptable BCS at the time of foaling (and through lactation) are easier to rebreed than thin mares. Ensure the mare is in an acceptable BCS, preferably 5 or greater. Increase the mare’s nutrient intake during the last trimester of gestation and lactation. This is easily accomplished by slowly adding a grain mixture to the forage portion of the diet. 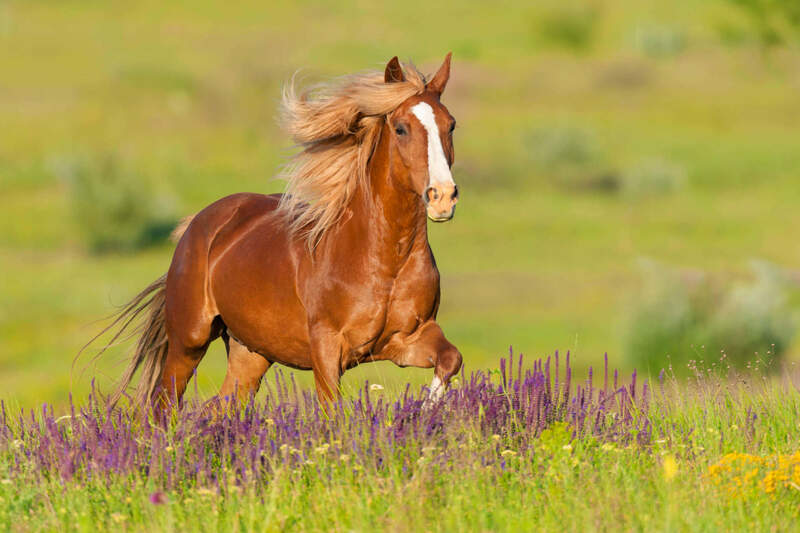 Choose a feed formulated for growing horses as the grain portion of the mare’s diet. This feed should also be fed to the foal through his/her yearling year. As milk production decreases and the foal begins to eat more grain, it is better to provide the grain via creep feeder. Controlling the amount of feed the foal can consume will minimize growth issues while supplying the nutrients required for proper growth. Free choice creep is not advisable as overconsumption may lead to developmental musculoskeletal problems. Have you bred a foal? Visit our Facebook page to share your story and foal pictures with us! We love to hear from our horse owners.